This video went viral on social media today and is quite fascinating to watch. I just had to do something interesting with it. What took you guys so long? The biggest question of my young life so far has finally been answered: there is water on Mars. Liquid water and at least ten swimming pools of it, someone said, not just puny ice caps. The next big question is if there is enough water and if it’s usuable. It seems a bit anticlimactic, as if scientists knew it all along but finally decided to let out the big secret. I sort of knew it all along, since there can’t possibly be just one planet in the entire universe that supports life. Actually, noone is still quite sure if there is life in those water pools. If there is, there are brand new theories to be discussed and new openings for the fantastic realm of science (sorry, 6,000 year Earth believers). Life may have come from Mars on gigantic pieces of the planet that got broken off during collisions, lifeforms being encased in tiny water droplets and deposited on the once hot and rocky sphere. But if it’s true that life started on Mars, how did it get there? Did it come from yet another planet? It’s the whole “what happened before the Big Bang complexity” How can anything suddenly come from nothing? Now that the big water question has been solved, it’s time to get going on going to Mars. The Mars One project is in the process of selecting 4 individuals who will take an estimated 4 month journey to the Red Planet and will set up the first colony bases as well as finding a way to grow food and sustain life. The greatest achievement in human history, other than landing on the moon, will be creating a viable civilization on Mars. To have a place to be once the inevitable ending comes for our earth would be monumental. If I ever got the chance to live on Mars (this is permanent) I probably would gracefully die on the red iron hills, just to have it of record that I’ve one of only so many to have perished on a different planet. But before that my daily life would be within a transparent tubing house, seeing the orange-reddish sky and the dust storms swirling around outside. Eating genetically grown plants that surprisingly don’t taste like rubber. Eating the meat from genetically grown animals stored in an artificial zoo environment. Sleeping on a bed that may have anti-aging powers. But there’s a million to one chance that will never happen. There’s a slight chance that no human will ever set foot on Mars, something going wrong with the spaceship or the length of the mission pushing the limits of any person on board. I have faith in humanity. I have faith that we can do anything. We are the smartest things in the universe. We were given super intelligent brains to solve and achieve things. If one can solve a Rubik’s cube in as little as 3 moves, one can find a way to land on Mars. But we still can’t figure out how to stop it from raining or not raining. I suppose we are more adept to figuring out the bigger things in life, some of us at least. Anyway, that’s my life ending statue: a dusty and rugged suited astronaut holding onto the American flag (or whoever gets there first) on the surface of Mars. The message on the base of the statue: There’s no going back. Only forward. If you had the chance to be reborn, would you choose to return as your present self, or would opt for a fresh start? Tell us about what motivates your choice. I bet this 16 year old girl wishes she could be reborn again. I bet she now wishes she hadn’t stabbed her mother 20 times with a kitchen knife, as if one time wasn’t enough. I bet she wishes she hadn’t watched those ISIS videos on YouTube, because her teenage life is virtually over now. She’ll be sitting in prison now until she’s 25, contemplating over what she did and maybe crying out for her mother to come back. Well, sorry girlie, it’s too late now for that. That Instagram picture of her tells the whole story of what she should be feeling like right now, though I don’t really know her actual emotions or if she has any conscious at all. Lisa Borch from Denmark was sentenced to nine years in prison for brutally stabbing her mother, Tina Römer Holtegaard, in her sleep after watching hours of ISIS beheading videos on repeat. It seems as if the videos had a psychological effect on the then 15 year old girl and motivated her actions. Her 29-year old boyfriend, Bakhtiar Mohammed Abdulla, was also involved in the murder and was sentenced to 13 years in prison and will be expelled from Denmark after his sentence is served. The killing happened in October of last year in the Kvissel, Denmark home and the two suspects finally were taken to court on September 15. 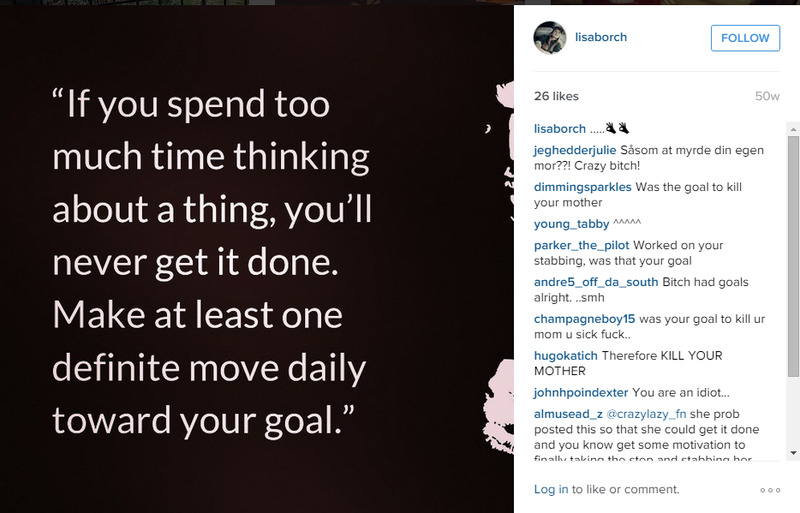 Her Instagram account blew up with hateful comments after the news came out about her crime, many of those comments underneath encouraging words for Borch and inspirational messages from her. It’s odd to see a girl that looked so normal and happy in her pictures and was looking to get a successful career in music and modeling and now those dreams are all over. It hurts me to see some of the comments telling Borch to “go kill herself” and changing the innocent meanings of her past pictures that came before the murder into being in connection with it. Commenters are now saying she used those 24 hours to plan the killing of her mother, her previously innocuous messages being twisted into motivational messages for her October crime. If this poor, obvious psychologically troubled girl could restart her life, she would know better than to be suckered into the persuasive teachings of ISIS. She would probably flee the country and go live in a place like the United States that is more sensible and civilized. It’s too bad she was born into the wrong society that doesn’t care what children are doing or what they are being exposed to. I don’t know what her mother was like or if she even knew Lisa was being brainwashed by those videos, but this is a very twisted and sick story that I felt compelled to discuss. It seems as if she being a child and being heavily influenced played apart in this. She met an Islamic man and became heavily infatuated with him to the point that she was steered into becoming fascinated with the ISIS videos. A young girl like that can’t quite think properly for herself yet, in my opinion. From what I read, her relationship with her mother was not very great. There were constant arguments over her going out with an Islamic man who had connections with the evil ISIS empire. Her sister had fled away from home because she was tired of the constant tension between the two. This is just another sad story involving the terrible organization that is ISIS. This time they planted thoughts in a teenager’s head and now her life is ruined. Those videos really need to be removed from YouTube. For more on this story, follow this link.